Bed Bug Exterminator | Control Bed Bugs | Westchester, NY. If you reside in Rockland, Westchester, Putnam, Bronx Counties and Greenwich CT, bed bugs can be a serious problem. Choose QualityPro Pest & Wildlife Services to take care of this often seriously difficult-to-eliminate problem. An infestation of your home is extremely unhealthy for you and your family. Many treatments you’ll find in the industry still use harsh chemicals to get rid of bed bugs, but this tactic will just create an even more unhealthy environment for your family. 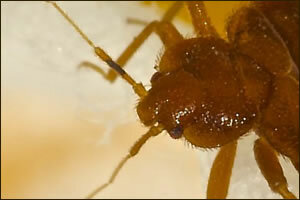 Bed bugs don’t just live in beds but in your carpet and furniture as well. You may have a bed bug problem and not even know it! If you start to notice that you have excessively itchy or bruised skin, it might be an infestation. We do a thorough job of exterminating the problem, removing both insects and their eggs safely and effectively. We use the most environmentally-safe and green-friendly methods to fully exterminate these pests. We also try and make the most affordable options available for all our clients without compromising the needs of your home.